On September 17, 2016, at 0204 central daylight time, an Agusta (Leonardo) A109S helicopter, N91NM, impacted trees and terrain near Chandler Field Airport (AXN), Alexandria, Minnesota. The commercial rated pilot and two crew members sustained serious injuries and the helicopter was destroyed. The helicopter was registered to North Memorial Health Care and operated by North Memorial Air Care under the provisions of Title 14 Code of Federal Regulations (CFR) Part 135 as an air medical positioning flight. Night instrument meteorological conditions prevailed at the accident site and an instrument flight rules (IFR) flight plan had been filed. The helicopter departed Brainerd Lakes Regional Airport (BRD), Brainerd, Minnesota at 0137 and was destined for the Douglas County Hospital helipad, Alexandria, Minnesota, via AXN. A review of the air traffic control (ATC) communications and radar data revealed that the pilot requested a clearance at 0135 and departed about two minutes later. Radar data indicated the helicopter climbed to 4,000 ft above ground level (agl) and flew southwest toward AXN. The radar data showed a generally straight and level flight with minimal altitude changes after the initial climb. The pilot contacted ATC and requested to proceed direct to KILVE, the initial approach fix for the RNAV (GPS) approach to runway 22 at AXN. The controller cleared the pilot for the approach and instructed him to maintain 4,000 ft until established on the approach. One minute later ATC lost radar contact with the helicopter and instructed the pilot to report when established on the approach. Ten minutes later the pilot reported inbound on KILVE. Additional radar data later indicated that the helicopter made a slight left turn which corresponded to an extended line of the final approach course to runway 22. The controller, who was still not in radar contact with the helicopter, approved a frequency change and requested that the pilot report the cancellation of the IFR flight plan, to which the pilot acknowledged; no further communications from the pilot were recorded. Radar data later indicated that the helicopter remained on the final approach course while descending until the last radar target was recorded at 0201:06; 4.75 nautical miles from the runway about 2,050 ft agl. An onboard device recorded the accident flight coordinates; figure 1 shows the helicopter's final flight path. In a postaccident statement the pilot stated that he received a call for a flight about 0100; after a review of the weather conditions he accepted the flight and then filed an IFR flight plan to AXN. He was in radio contact with ATC, but radar contact was lost about half way through the flight. About 20 miles from AXN he noticed clouds quickly forming underneath the helicopter. He stated that ATC cleared the flight for the RNAV (GPS) 22 approach to AXN as clouds were still forming beneath the helicopter. With the landing sight not visible, he initiated a missed approach by utilizing the go-around function of the helicopter's autopilot and had 100% engine power applied. He stated that during the missed approach the helicopter made a quick 45° left bank so he applied right cyclic. Then the helicopter banked sharply to the right. The flight nurse who was seated in the middle cabin, stated that the IFR flight to AXN was uneventful until they were near the airport. When the helicopter descended near AXN and he could see the runway lights beneath the helicopter through the fog. He couldn't determine the altitude of the helicopter because they were in the fog. He added that the pilot stated to the crew that they weren't going to break out of the fog and they would go-around. He did not know exactly why they needed to go around. He added that the helicopter banked to the right, then shuddered when the alarms and bells sounded. The helicopter shudder was "on the lighter side" of intensity, but he had never felt the helicopter shudder like that before. The engines sounded normal throughout the flight and he did not recall any unusual sounds or anomalies with the helicopter until the shudder. He did not remember if the helicopter entered a spin during the event. The helicopter impacted the tops of several tall trees and the ground, then continued into a wooded area (figure 2). Several nearby residents were awake at the time of the accident and heard the helicopter's engines and then the sound of the impact. A review of the recorded flight data revealed that the flight path was in line with the GPS approach course and followed the respective waypoints. The helicopter intercepted the approach's last waypoint, WANBI, at 02:02:31 then the flight path started to deviate right of course (figure 3). The flight path continued toward AXN while maintaining the slight right deviation until 02:03:11 when the helicopter reached 1,840 ft, which is the approach's minimum descent altitude. 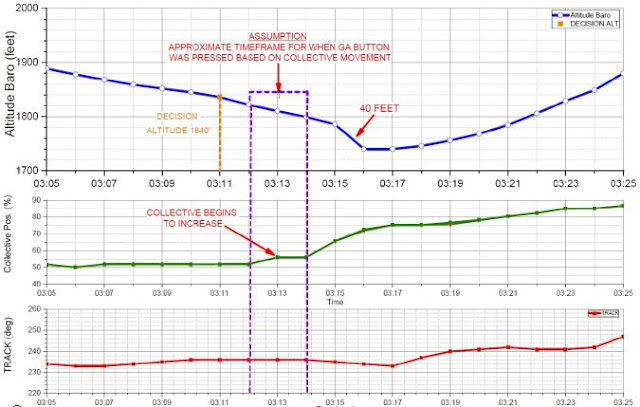 Between 02:03:12 and 02:03:14 the collective position percentage increases, which is consistent with the reported go-around maneuver (figure 4). The helicopter descends to 1,740 ft until a climb began at 02:03:17. The helicopter climbed and turned right with a maximum bank angle of 50°. The flight path continued right as the helicopter then descended and the collective position continued to increase. The pilot was the Director of Operations for North Memorial Air Care. In the preceding 6 months the pilot had accumulated 2.4 hours of flight time in actual instrument conditions, logged 11 precision instrument approaches, and 6 landings at night. The North Memorial Operation's Manual stated that for recent night flight experience, each pilot is to abide by the requirements of 14 CFR Part 135.247(a)(2), which required in the preceding 90 days, he pilot must complete 3 takeoffs and 3 landings as the sole manipulator of the flight controls in the same aircraft category and class. The pilot had logged 6 night takeoffs and landings in the preceding 90 days. 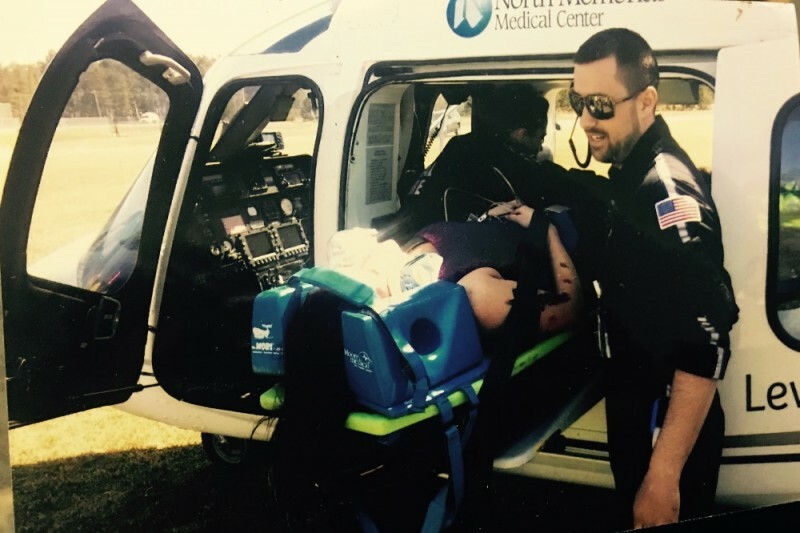 On June 12, 2015, the helicopter was equipped with a Spectrum Aeromed Medical Conversion Kit, supplemental type certificate (STC) SR02974CH, consisting of a base assembly with pivot, a stretcher, a medical attendant seat, and other medical components. The helicopter was equipped with a GPS roll steering modification that featured a HEADING/GPS STEER switch, per an STC. The switch allows the pilot to manually select the heading (HDG) reference source. When the switch is selected to 'HEADING', the flight director (FD) computer calculates the necessary roll commands to bank the helicopter to intercept and maintain the heading selected on the electronic horizontal situation indicator (EHSI). With the switch selected to 'GPS STEER', the FD computer receives the heading error signal as computed by a dedicated STC box which compares the requested GPS heading and the actual heading. The FD transmits the calculated roll commands to the helipilot computers, which would in turn drive the pitch and roll rotary trim actuators to achieve the target attitude, rate, and heading. In case of a malfunction or erroneous setting of the system, the A109S automatic flight control system (AFCS) has two different limiters in place to prevent excessive roll commands: one in the Flight Director computer, which imposes a max roll command in HDG mode of ±20°, when coupled to the AFCS for hands-off flying, and one in the helipilot computers, which had a target maximum roll attitude of ±24° and a maximum commanded roll rate of ±8.2° per second for short term stabilization purposes. 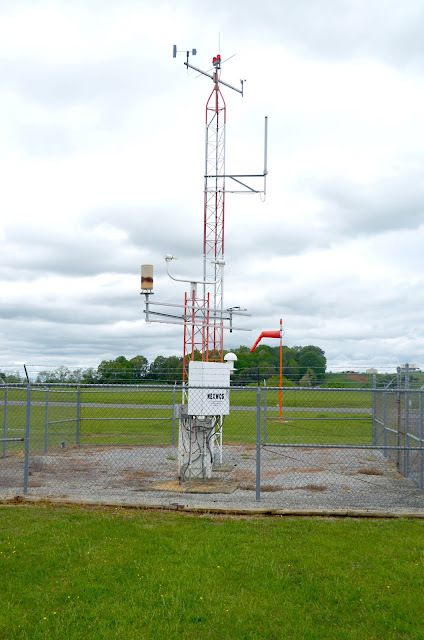 At 0201, the AXN automated surface observing system (ASOS) recorded wind from 290 degrees at 10 knots, 9 miles visibility, scattered clouds at 400 ft, broken clouds at 3,600 ft, temperature 57 degrees F, dew point 57 degrees F, and altimeter setting 29.87 inches of mercury. At 0209, the AXN the ASOS recorded wind from 290 degrees at 12 knots, 4 miles visibility, mist, broken clouds at 300 ft, temperature 57 degrees F, dew point 57 degrees F, and altimeter setting 29.87 inches of mercury. An AIRMET Sierra for IFR conditions due to mist and precipitation was issued on September 16 at 2145 and was valid at the accident time. A search of official weather briefing sources indicated the pilot used the ForeFlight application on his iPad at 0119 and received Lockheed Martin Flight Service weather briefing information in both text and graphical format. The weather information contained all valid AIRMETs, weather observations, and forecasts valid between the departure and destination airports; the pilot viewed the graphical images on his iPad. There is no record of the pilot receiving or retrieving any other weather information before the flight. 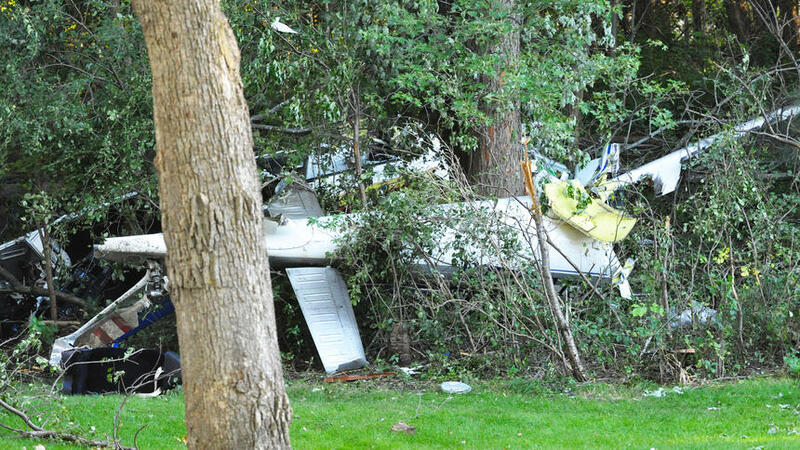 The accident site was located in a residential area surrounded by trees about 1,000 yards northwest of the approach end of AXN's runway 22 (figure 5). The debris path was about 130 yards long and began with lopped tree tops (95 to 100 ft tall) and ended about 30 yards beyond the main wreckage. The middle of the debris path was in a back yard of a residence and consisted of lopped tree tranches, fragmented main rotor blades, and pieces of the helicopter. The initial impact marks were several parallel ground scars followed by the helicopter's tail skid in an impact crater. The debris path continued with a large ground impact area that contained helicopter pieces, followed by the main wreckage. The fuselage came to rest on its left side, was separated aft of the engines, and wrapped around two trees. The right side of the fuselage exhibited ground impact damage and mud smearing. The tail and aft portion of the rear fuselage were pointing in an opposite direction from the fuselage. The bottom of the tail contained mud smearing and splatter marks near the tail rotor. The right pilot seat and one passenger seat pan had separated from their respective mounts. A postaccident examination of the helicopter and related systems was conducted by the NTSB with assistance provided by technical representatives from the helicopter manufacturer and system component manufacturers. The flight control and autopilot system, which included mechanical, hydraulic and electronic components, revealed no malfunctions or anomalies that would have precluded normal operations. The HEADING/GPS STEER pushbutton was found in the HEADING position and electrical continuity was confirmed. To confirm switch functionality of the GPS STEER position, the pushbutton was depressed. Electrical continuity was confirmed to the GPS STEER position and the HEADING position was no longer active. The helicopter's control system actuators were subjected to CT scans to confirm internal component configuration and integrity without disassembly. The following actuators were scanned: roll trim actuator, both left and right roll linear actuators, and both left and right pitch linear actuators. The scans did not reveal any preimpact anomalies that would have precluded normal operation. The NTSB CT Specialist Factual Report is included in the public docket for this accident report. The roll artificial feel and trim actuator were examined at the manufacturers facility under the supervision of the Agenzia Nazionale per la Sicurezza del Volo (ANSV) of Italy. Results of the examination showed that there were no mechanical or electrical malfunctions with the actuator and the unit passed its acceptance testing. The two helipilot computers and the FD computer were examined at the manufacturers facility under the supervision of the ANSV. The first helipilot computer sustained minor external damage, but there was no evidence of internal mechanical damage, or electrical/burn failures of the components located on the circuit boards or the circuit boards. All internal circuits were within specification. Control of the servo amplifiers output signal was confirmed with no anomalies noted. The test confirmed that the computer provided the correct command signal to position the linear actuators; the tests performed were successful and each pitch, roll, and yaw channel worked properly. Based on the results of the testing, no functional anomalies were found. The second helipilot computer sustained significant external damage and internal damage to the motherboard; the yaw, pitch, and roll cards were found separated from the motherboard due to the mechanical deformation of the chassis. The gain card was undamaged. Due to the internal damage, functional testing was limited to the roll and gain cards by using an exemplar chassis assembly. All internal circuits were within specification. Control of the servo amplifiers output signal was confirmed with no anomalies noted. The tests performed were successful and each pitch, roll, and yaw channel worked properly. Based on the results of the testing, no functional anomalies were found with the roll channel. The FD computer sustained significant external damage and the internal circuit cards were impact damaged but did not show signs of electrical/burn damage. A functional test of the FD computer could not be performed. The three main rotor actuators, identified as red, yellow, and blue, were examined at the manufacturers facility under the supervision of the ANSV. The red and yellow actuators attachments were fractured under overload. The actuators were subjected to the manufacturer's functional tests procedures; each actuator passed the functional tests and disassembly of the units was not performed. The results of the functional testing are provided in the NTSB Systems Factual Report included in the public docket for this accident report. Leonardo Helicopters completed extensive flight simulations and testing based on the accident data. The simulator session was performed with an Agusta A109E level D full flight simulator (FFS) at the Leonardo Helicopter Training Academy, to reproduce the accident Flight and identify anomalies or contributing factors. An A109S FFS was not available, but the functionally of the A109E FD and helipilot computers are identical among the two simulator types. The testing revealed that the helicopter was operated within the prescribed limits and there was no evidence of a mechanical malfunction. The data revealed that the helicopter performed a constant right climbing turn with decreasing airspeed followed by a progressive right bank with airspeed and descent rate increasing. The simulator testing did not find evidence of an uncommanded 45° bank as reported by the pilot. The simulation required large collective inputs and steep right bank, which were the most critical conditions in the simulations, especially when performed in night conditions with no visual references. The simulation recovery maneuver was less demanding in day conditions with clear visual references. Further testing revealed that the GPS roll steering modification on an A109S cannot compromise the FD and AFCS functionalities up to the point of upsetting the helicopter attitudes. Each engine is equipped with a DCU and both units were downloaded by the engine manufacturer under the supervision of the Transportation Safety Board of Canada. The purpose of the DCU is to serve as a repository for various engine parameters, accumulated operation time, accumulated part cycles, and specific operational exceedance data. The electronic engine controls automatically store the data in the DCU in snapshot format when there is a triggering event. Engine data stored during the last 100 hours of operating time was analyzed. Both engines were producing power at the moment of impact and no preimpact engine anomalies were recorded. The DAU was examined and downloaded by the manufacturer under the supervision of the Federal Aviation Administration (FAA). The unit did not exhibit any significant impact damage and the download of both channels A and B was successful. The data was redundant from both channels and did not reveal any recorded faults or exceedances. The Sandel ST3400 is an integrated Terrain Awareness and Warning System (TAWS). The device is capable of recording GPS coordinates, track, barometric altitude, vertical velocity, and radar altitude. The data retrieved from the device revealed an operating time from 01:25:54 to 02:03:42 CDT. On approach to AXN the device produced no voice callouts since the input from the radar altimeter never met the mandatory call-out threshold of 300 ft AGL. Additionally, there were no forward-looking terrain avoidance or ground proximity warning system alerts recorded in the flight data during the approach phase of the accident flight as the alerting buffer never indicated terrain and/or obstacle clearance issues. The Appareo Stratus 2S is a battery-operated automatic dependent surveillance-broadcast (ADS-B) receiver with GPS capability designed to interface with an iPad, iPhone, or iPod Touch running the ForeFlight Mobile application. The device did not have any recorded data from the accident flight. The iPad was found in the wreckage and displayed a map page within the ForeFlight application. The device was given to the operator and later sent to the NTSB Recorders Lab for download since the device was capable of storing non-volatile memory. When a download was attempted by the NTSB, the device had been manually reset and no data was retrieved. The data card was inserted into a surrogate Garmin GNS 530W unit at the NTSB Recorders Laboratory. When the device is powered using the docking station, the GPS is automatically put into a "simulator" mode; therefore, the map location shown on the screen was not indicative of any accident information. The map database was version 4.00 and the aviation database expiration date as October 13, 2016. When powered on, the device's communication (COM) frequency was set to 123.000 megahertz MHz and the localizer (LOC) frequency was set to 109.70 MHz. These frequencies corresponded to the pilot's statement that the last LOC frequency would have been selected for BRD instrument landing system (ILS) RWY 34 approach, which utilizes 109.7 MHz. Miles Weske, a flight paramedic, was the most seriously injured in a Sept. 17 helicopter crash in Alexandria. He suffered fractures of his C2 and C3 vertebrae, a liver laceration, multiple broken ribs, a broken sternum, broken femur, broken ankle, collapsed lungs and blood in his lungs. BROOKLYN CENTER, Minn. — Miles Weske, the North Memorial flight paramedic who almost lost his life in a helicopter crash in Alexandria last year, and his wife, Brooklyn, say they will pursue legal action against North Memorial after changes to his employment status. The legal action is being pursued after Miles was recently terminated from North Memorial Air Care while still recovering from severe injuries sustained in the company helicopter crash. "We are going to take legal action," Brooklyn said. "Even if all that comes out of it is this not happening to someone else, we are perfectly happy with that." Though terminated from Air Care, Brooklyn states that Miles is still employed by North Memorial in the billing department. According to North Memorial, Miles Weske is still a team member. The Brooklyn Center-based organization, which operates hospitals and clinics as well as ambulance services, had no other comment. On Sept. 16, 2016, Miles was in the back seat of a North Memorial Air Care helicopter when it crashed north of the Alexandria Municipal Airport at about 2 a.m. He suffered fractures to two vertebrae, a liver laceration, multiple broken ribs, a broken sternum, broken femur, broken ankle, collapsed lungs and blood in his lungs. 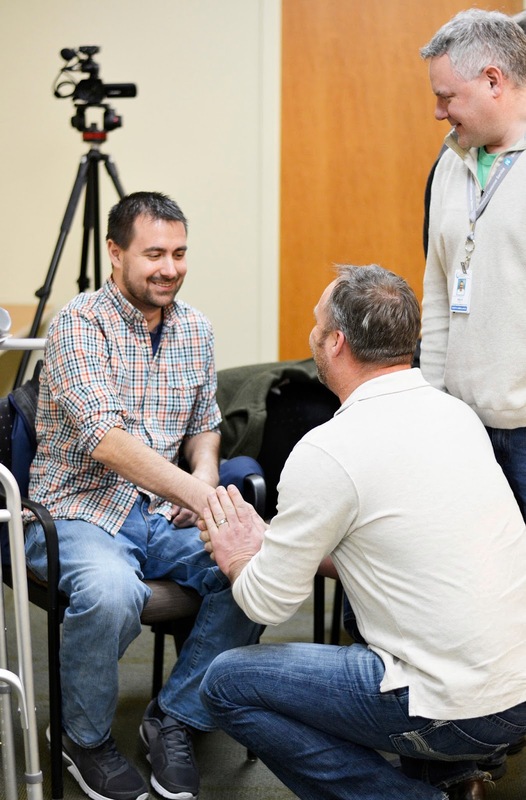 After spending two months in the hospital, Miles returned to his home in Nisswa. Though he knew he could not return to work as a flight paramedic, he wanted to remain involved with Air Care. According to a blog post by Brooklyn, Miles was told in January he had been given a full-time position in which he could work from home and have a flexible schedule so he could attend appointments regarding his injuries from the crash. On Jan. 31, Miles went to Brooklyn Center for a meeting about his ideas regarding quality assurance and quality improvement for North Memorial Air Care. 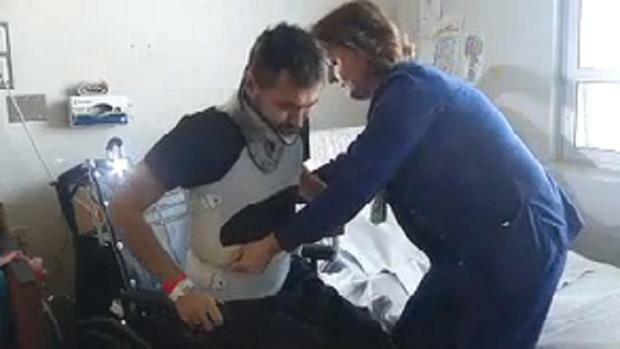 He was sent home with a computer and instructions for accessing documentation. In February, according to the blog post, Miles began to wonder why he was not being given work related to quality assurance and quality improvement. He called his supervisor and was told he was not needed for that area. He was told his position was to ensure there was information in the boxes on charts that the billing department would need. The next month, Miles received a letter from the head of human resources at North Memorial Medical Center stating that he had been officially terminated from his position as a flight paramedic with the Air Care division of North Memorial, something Miles' supervisor told him was just part of the process. Through a series of phone calls in April, Brooklyn's blog states that Miles was told there could be no special treatment for his circumstances. His supervisors allegedly said he would need to arrange paid time off three weeks ahead of time and work normal hours, something that is made difficult by the number of appointments Miles has each day. Miles was told he would not receive special treatment and that if the schedule did not work for him, it was suggested he look into other careers. According to the The Americans with Disabilities Act of 1990 (ADA), it is "unlawful to discriminate in employment against a qualified individual with a disability. The ADA also outlaws discrimination against individuals with disabilities in State and local government services, public accommodations, transportation and telecommunications. This booklet explains the part of the ADA that prohibits job discrimination. This part of the law is enforced by the U.S. Equal Employment Opportunity Commission and State and local civil rights enforcement agencies that work with the Commission." Two other crew members on the helicopter were treated for less serious injuries and were discharged shortly after the crash. "We are reminded each day that our lives have changed forever," Brooklyn said. "We have lost the most important thing in our life, which is time at home with our family. Each day is filled with appointments, travel, phone calls, paperwork and constant reminders of the permanent deficits this incident has caused ... And to have lost the support of the superiors of an organization that boasts their dedication to 'taking care of family' is disturbing." 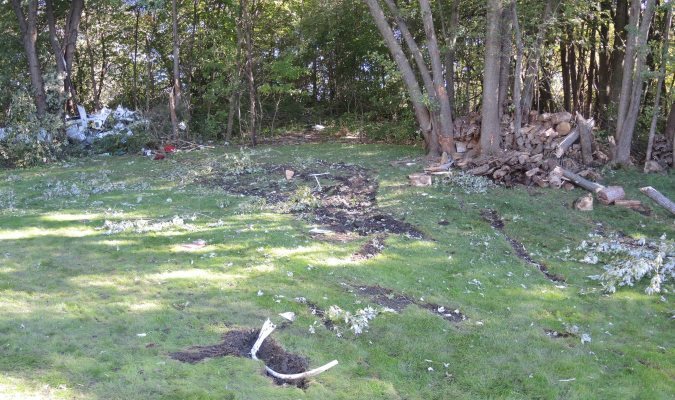 On September 17, 2016, at 0207 central daylight time, an Agusta S.p.A A109S helicopter, N91NM, impacted trees and terrain near Chandler Field Airport (AXN), Alexandria, Minnesota. The commercial rated pilot and two crew members sustained serious injuries and the helicopter was destroyed. The helicopter was registered to North Memorial Health Care, Brooklyn Center, Minnesota, and operated by North Memorial Medical Center under the provisions of 14 Code of Federal Regulations Part 135 as a positioning flight. Night instrument meteorological conditions prevailed at the accident site and an instrument flight rules (IFR) flight plan had been filed. The helicopter departed Brainerd Lakes Regional Airport (BRD), Brainerd, Minnesota about 0135 and was destined for the Douglas County Hospital helipad, Alexandria, Minnesota. The pilot stated that he received a call for a flight request about 0100, accepted the flight, and then filed an IFR flight plan to AXN. He was in radio contact with air traffic control (ATC), but radar contact was lost about half way through the flight. About 20 miles from AXN he noticed clouds quickly forming underneath the helicopter. The pilot was cleared for and attempted the RNAV GPS 22 approach to AXN as clouds were still forming beneath the helicopter. The pilot initiated a missed approach by utilizing the "go around" function of the helicopters autopilot. During the missed approach, the helicopter made an uncommanded left bank followed by a right bank. The pilot attempted to counteract the bank by applying opposite cyclic control. The helicopter impacted several tall trees and then the ground and continued into a wooded area. Several nearby residents were awake at the time of the accident and heard the helicopters engines and then the sound of the impact. Two other witnesses were outside of their homes east of the airport and observed the helicopter flying overhead prior to the accident. At 0201, the AXN weather observation recorded wind from 290 degrees at 10 knots, 9 miles visibility, scattered clouds at 400 ft, broken clouds at 3,600 ft, temperature 57 degrees F, dew point 57 degrees F, and altimeter setting 29.87 inches of mercury. At 0209, the AXN weather observation recorded wind from 290 degrees at 12 knots, 4 miles visibility, mist, broken clouds at 300 ft, temperature 57 degrees F, dew point 57 degrees F, and altimeter setting 29.87 inches of mercury. The helicopter has been retained for further examination. JACKSONVILLE, Fla. - The Federal Aviation Administration has approved Florida State College at Jacksonville to certify graduates of its professional pilot technology program with an airline transport pilot certificate at a reduced number of flight hours, the college announced Wednesday. Flight students interested in flying for airlines can receive a 250-hour discount toward the 1,500 hours of flight time required to be eligible for the ATP certification through FSCJ. FSCJ’s professional pilot technology program provides extensive, advanced training that aligns with industry trends and educates students on current FAA standards and regulations to produce knowledgeable, proficient, safe and responsible pilots and flight instructors for the National Air Transportation System, college officials said. The FAA authorization also reduces the age requirement for the ATP for FSCJ graduates to 21 instead of 23, helping students launch their careers two years earlier. 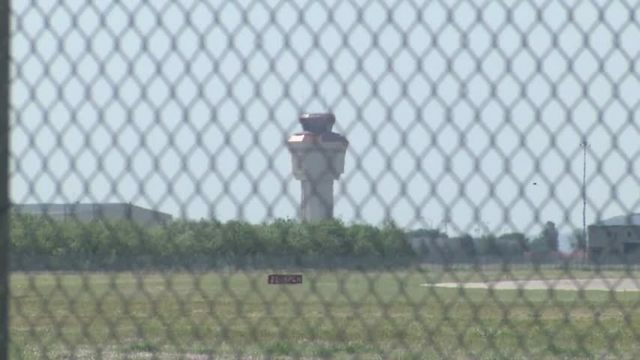 ABILENE, Texas - The Federal Aviation Administration has been working since 2012 to upgrade air traffic control systems across the country and Abilene Regional Airport is included on the list. The FAA has spent 7.5 billion already on introducing the NEXTGEN system to major airports across the country and it will eventually be at all airports. The main change is moving from a ground-based radar system to a GPS system that will track aircraft. "[NEXTGEN is] not just one set of equipment, it is different types of equipment kind of coming together for the airspace system," said Don Green, director of transportation services at ABI. Being able to track planes with GPS provides real-time updates to air traffic controllers, allowing them to be more efficient when directing aircraft from point A to B. "They can go from Abilene Regional Airport directly to DFW or directly to Houston without flying an air route, which may not be directly the shortest distance point to point," Green said. Air routes are similar to using highways to get from one city to another – they’re not always a direct path. The direct routes will shorten flight times, resulting in less fuel usage. That should save customers money and time in the air. Another change to be made would be transitioning from a verbal communication system to a data communication similar to text messaging. This allows controllers to handle more traffic by transmitting information faster. This project is funded by the FAA but is still dependent on the Congressional budget. It is aimed to be in effect by 2025. The Greeneville-Greene County Airport Authority heard bad news and good news on Monday. The bad news was that the Automated Weather Observation System that was installed years ago at the airport was not put in place properly and must be moved. The good news is that it will not cost the authority a penny to do so. Authority Chairman Janet Malone told the authority that the AWOS units, which collect and transmit weather information, were improperly installed at general aviation airports all across the state, usually by being placed too close to other structures, as is the case in Greeneville. Thus the AWOS devices are being moved at state expense at every airport where they were not properly installed. The authority voted to authorize Malone to sign the needed agreement to let the work be done. The AWOS installation at the Greeneville-Greene County Municipal Airport is too close to above-ground fuel tanks. Proximity hampers the accuracy of data the equipment gathers, Malone has been told.She also informed the authority that a little over a month of work is likely to begin soon at the airport as the planned Med Trans site development project is likely to start within the next two to three weeks and take a month to a month-and-a-half to complete. The authority also approved purchase of a 2004 Chevy Impala from the Greeneville Police Department to be used as a “crew car” at the airport. Crew cars, sometimes called courtesy cars, are made available for the use of flight crews who use the airport and may need short-term, short-distance car transportation during wait periods. The Impala replaces a Jeep that had been used as a crew car. The Jeep was recently sold for just over $1,000, and that is the same price needed to buy the Impala. The airport group also voted to hold a called meeting Friday at 9 a.m. to make budget plans for the next fiscal year. It also voted to retain, for at least one more year, its current auditing firm. At Malone’s suggestion, the authority also voted to review its current Tennessee Municipal League insurance plan to see if changes are needed. After Friday’s called meeting, the next regularly scheduled Airport Authority meeting will be Tuesday, May 30, the day after Memorial Day, at 9 a.m. in Greeneville’s Town Hall. YOUNGSTOWN - Allegiant Travel Co., the only commercial airliner in operation at the Youngstown-Warren Regional Airport, announced quarterly earnings that show a significant decline in income from the first quarter of 2016 for several reasons. Lukas Johnson, vice president of network and pricing for Allegiant, said the company raised fares and turned positive year-over-year yield in both February and March. “We hope to see continued strength throughout the rest of 2017,” Johnson said in a call with investors. The company reported income of $72.9 million in the first three months of 2017 compared with $121.1 million in the same period last year – a 39.8 percent decrease. Net income dropped from $72 million in 2016 to $41.6 million in 2017 – a 42.2 percent decrease. Earnings per share were $2.50 for the first quarter compared with $4.29 in the same quarter of 2016. The company is currently transitioning to an all-Airbus fleet, which chairman and CEO Maurice J. Gallagher, Jr. said should be complete by the end of 2019. The company currently has several McDonnell Douglas planes. “One-time expenses associated with this transition will be lumpy,” Gallagher said in a news release. Scott Sheldon, senior vice president and chief financial officer for Allegiant, said nonfuel costs increased by 11.6 percent. Eight percent of that was due to a new agreement with pilots. “We will continue to be challenged by historically low pilot productivity,” Sheldon said in the call with investors. The news release also notes that Easter moving into April negatively affected the company’s first- quarter earnings. The number of passengers served by Allegiant increased from 2.6 million in the first quarter of 2016 to 2.9 million in the first quarter of 2017 – an 11.1 percent increase. Allegiant is operating 358 routes now versus 298 at the same time year, and it expects to begin 23 new routes in the second quarter of 2017 including the new city of Louisville, Ky. The pilot-in-command (PIC) and second-in-command (SIC) were conducting a positioning flight. According to the dispatch flight release, the pilots planned to land on runway 14, which was assumed to be wet. Before the flight, notices to airmen (NOTAMs) had been issued, which stated that the runway 14 threshold had been displaced 3,377 ft and that the instrument landing system and RNAV instrument approaches were not available. Although the NOTAMs were included in the flight release paperwork, dispatch personnel overlooked them, which resulted in flight planning numbers predicated on the full length of runway 14. During the approach, the pilots listened to the automatic terminal information service information and then became aware that runway 14 was shortened due to construction. Subsequently, the pilots calculated the landing distance required to land on a wet runway and chose to land on runway 1, which was the longer runway. The PIC reported that, during the approach, they encountered light rain but that the rain was moving away from the airport, which alleviated any concern regarding standing water on the runway. A review of flight data recorder data showed that the SIC flew a stabilized approach 9 knots above the reference speed (Vref) and that the airplane touched down 903 ft from the runway threshold at a groundspeed of 118 knots. The SIC stated that he began braking with half pressure and continued to increase the brake pressure to maximum, which was the normal braking procedure, but that the airplane did not appear to be decelerating. FDR data confirmed that the SIC began applying the brakes immediately upon touchdown and progressively commanded full braking performance from the brake system. The PIC informed the SIC that they needed to slow down, and the SIC replied that he had "no braking." The SIC then applied the emergency parking brake (EPB), but the airplane still did not slow down. FDR data indicated that the airplane achieved its maximum deceleration during the landing roll before the application of the EPB. FDR data showed that, once the SIC applied the EPB, the wheel speed dropped to 0. After determining that there was insufficient runway remaining for a go-around, the pilots realized that the airplane was going to exit the end of the runway. Subsequently, the airplane began to skid along the runway, which resulted in reverted-rubber hydroplaning, thus decreasing the stopping performance, and then exited the departure end of the runway and continued about 400 ft in soft terrain before it impacted a ditch and came to a stop. An examination of the brake system and data downloaded from the brake control unit indicated that the brake system functioned as commanded during the landing. Analysis of the runway surface and the amount of precipitation showed that there should have been no standing water on the runway. Landing distance calculations performed in accordance with the aircraft flight manual (AFM) showed that, even though the SIC exceeded Vref, the airplane should have been able to stop on the available runway. According to the National Transportation Safety Board's airplane performance study, the maximum wheel braking friction coefficient achieved during the portion of the ground roll before the application of the EPB was significantly less than the maximum wheel braking coefficient that would have been expected given the unfactored wet-runway landing distances published in the AFM. However, the study determined that, if the EPB had not been engaged and airplane had maintained the braking friction level attained during the landing roll before the engagement of the EPB, it would have been able to stop on the available runway. Therefore, the SIC's application of the EPB, which locked the wheels, reduced the friction level, and decreased the braking performance, prevented the airplane from stopping on the available runway. Nonetheless, the braking friction deficit observed in this accident showed that the stopping performance of the airplane was more consistent with AFM landing distances for runways contaminated with standing water than for runways that were merely "wet" even though it was determined that the runway could not have been flooded. Since the accident, the operator has issued a flight operations bulletin instructing pilots to conduct a landing distance assessment using the AFM contaminated runway performance data for the lowest contamination depth when the following three conditions exist: 1) the runway did not have a treated surface, 2) thrust reversers were deferred or not installed, and 3) the airport was reporting rain or heavy rain. The second-in-command's (SIC) engagement of the emergency parking brake (EPB), which decreased the airplane's braking performance and prevented it from stopping on the available runway. Contributing to the SIC's decision to engage the EPB was the lower-than-anticipated deceleration due to a wet-runway friction level that was far lower than the levels used to determine the wet-runway stopping distances in the Airplane Flight Manual (AFM) and necessitated a landing distance considerably greater than that published in the AFM. On September 19, 2014, about 0847 central daylight time, an Embraer EMB-505 Phenom 300 airplane, N322QS, impacted a ditch after the airplane departed the end of the runway while landing at Lone Star Executive Airport (CXO), Conroe, Texas. Neither of the two airline transport-rated pilots were injured. The airplane was substantially damaged. The airplane was being operated by NetJets Aviation, Inc. (NetJets), as a 14 Code of Federal Regulations (CFR) Part 91 positioning flight. Instrument meteorological conditions existed at the airport at the time of the accident, and an instrument flight rules flight plan had been filed. The flight originated from Nashville International Airport, Nashville, Tennessee, at 0706. According to the dispatch flight release paperwork, the pilot-in-command (PIC) and second-in-command (SIC) planned to land on runway 14, which was assumed to be wet. Before the flight, notices to airmen (NOTAMs) had been issued, which stated that the runway 14 threshold had been displaced 3,377 ft and that the instrument landing system (ILS) and RNAV instrument approaches were not available. Although the NOTAMs were included in the flight release paperwork, dispatch personnel overlooked them, which resulted in flight planning numbers predicated on the full length of runway 14. According to cockpit voice recorder (CVR) information, at 0827:04, the pilots received the automatic terminal information service (ATIS) information, which indicated that the runway 14 takeoff and landing distance was 4,111 ft and that the ILS for runway 14 was out of service. The pilots calculated the runway length required for a wet runway landing and then chose to land on runway 1, which was the longer runway. The PIC stated that, during the approach, the flight encountered light rain but that the rain was moving from the northwest to the southeast, away from the airport and that this alleviated any concern about standing water on the runway. He added that both he and the SIC had previously landed the EMB-505 in moderate-to-heavy rain with no decrease in braking ability. The CVR recorded the pilots briefing the approach and missed approach procedures. Subsequently, the tower controller cleared the runway 1 RNAV approach, and the pilots then discussed alternate airports in the area. At 0841:30, the tower controller cleared the airplane to land and stated that moderate-to-heavy rain was at the airport. The pilots conducted the Before Landing checklist and continued the approach. While continuing the approach with the SIC flying the airplane, they saw the runway at 600 ft above ground level, and the copilot disengaged the autopilot at 400 ft. At 200 ft, the SIC reduced the power and adjusted the altitude and airspeed for a stabilized approach with a maximum airspeed during the approach of 130 knots. In his postaccident written statement, the PIC stated that the landing appeared normal and "smooth." The SIC stated that he began braking with half pressure and continued to increase the brake pressure to maximum, which was the normal braking procedure. Sounds recorded on the CVR consistent with the airplane touching down were heard at 0837:13, followed by the pilots stating that the airplane was not slowing down. The SIC stated, "brakes. Emergency brakes," followed by "nothin' man" and "I got nothin'." The PIC stated "where's the brakes," followed by "where are they?" The PIC then said "go…don't go sideways, don't go sideways." The airplane exited the departure end of the runway and continued about 400 ft through soft/muddy terrain before coming to rest half-way down a ditch. According to the air traffic controller who witnessed the accident, the pilots flew the RNAV runway 1 approach and broke out of the clouds at the minimums for the approach. The controller stated that the airplane touched down just past the 1,000-ft marker on the runway and did not appear to decelerate as it continued down the runway. The PIC held an airline transport pilot certificate with an airplane multiengine land rating and a commercial pilot certificate with airplane single-engine land and balloon ratings. He held type ratings in Cessna 500, 650, and 750; Embraer 505; and Hawker Siddeley HS-125 airplanes. A limitation on the EMB-505 type rating was the requirement of an SIC. The PIC's last flight check was in the EMB-505 on May 12, 2014. The PIC was issued a first-class Federal Aviation Administration (FAA) medical certificate on April 3, 2014, which contained the limitations that it was not valid for any class after October 31, 2014, and that he must wear corrective lenses. He had 13,466 hours of flight time, of which 322 hours were in EMB-505 airplanes. The SIC held an airline transport pilot certificate with an airplane multiengine land rating and a commercial pilot certificate with an airplane single-engine land rating. He held type ratings in ATR-42, ATR-72, Cessna 750, Bombardier CL-65, and Embraer 505 airplanes. Limitations on the CL-65 type rating were SIC privileges only and circling approaches in visual meteorological conditions. A limitation on the EMB-505 type rating was the requirement of an SIC. The SIC's last flight check was in the EMB-505 on May 12, 2014. The SIC was issued a first-class FAA medical certificate on July 22, 2014, with no limitations. He had 9,861 hours of flight time, of which 361 hours were in EMB-505 airplanes. The accident airplane was a twin-engine turbofan, low-wing airplane, serial number 50500165, manufactured in 2013. The airplane was type certificated as a 14 CFR Part 23 commuter category airplane and was configured for two flight crewmembers and seven passengers. The airplane was equipped with two Pratt & Whitney PW535E turbofan engines, each of which delivered 3,360 lbs of thrust. The airplane was maintained in accordance with the manufacturer's inspection program. The last inspection was completed on July 2, 2014, at a total airframe time of 597.7 hours. The airplane's hydraulic brake system delivered hydraulic pressure to the brakes via input from the brake pedals. The hydraulic pressure to the brake system was supplied at a maximum of 3,000 pounds per square inch (psi). The SIC (right seat) brake pedals were mechanically linked to the PIC (left seat) brake pedals. Each PIC brake pedal was connected to a pedal position transducer (PPT), each of which produced two independent electrical outputs that were proportional to the respective pedal displacement to the brake control unit (BCU). The BCU controlled the main brake system, which was a brake-by-wire system with an antiskid function. The only pedal force feedback to the pilots was from a force spring installed on the pedals that provided a consistent pedal resistance regardless of the runway condition and the pressure applied. Wheel speed information was sent to the BCU via two axle-mounted speed transducers. The BCU factored the output from the wheel speed transducers, the PPTs, and two brake line pressure transducers then sent an electrical command to the associated brake control valve. The brake system had an antiskid function (which controls slip ratio) and a locked-wheel protection (which detects deep skids). The antiskid function worked independently on each wheel by comparing the current wheel angular speed to a reference angular speed, which was calculated based on the speed of that same wheel. The locked-wheel protection compared both main landing gear (MLG) wheel speeds and alleviated brake pressure when the slower wheel fell below 30% of the opposite wheel speed. The airplane was equipped with an EPB to stop the airplane if the main brake system failed. The EPB was operated by a T-handle on the control pedestal, which was mechanically linked via a steel cable to the EPB valve. The antiskid function was not available when using the EPB. An examination of the brake system and the data downloaded from the brake control unit (BCU) indicate that the brake system functioned as commanded during the landing. The airplane had a ground spoiler function that deployed the spoiler panels on the ground during landing to decrease lift, increase drag, improve braking, and reduce stopping distance. The airplane must be on the ground, the thrust levers must be in the "idle" position, and the ground spoilers must be armed for them to deploy during landing. The ground spoiler function automatically armed when the weight-on-wheels (WOW) sensors indicated "in-air" for more than 10 seconds and the airspeed was valid and greater than 60 knots indicated airspeed (KIAS). In general, 14 CFR Part 23 certification regulations require that dry-runway landing distances be published in airplane flight manuals (AFM) and that they be based on performance demonstrated during flight tests on smooth, dry, hard-surfaced runways. Certification regulations do not require the publication of landing distances on other-than-dry runways, although certification applicants may choose to present this information to the regulator. If the applicant provided this information, it would not necessarily be based on flight tests (largely because of the difficulty of achieving a consistent "wet" or "contaminated" runway surface) but rather derived by calculations based on assumptions agreed to by the regulator. The EMB-505 was first certificated by the Brazilian regulator (the Agência Nacional de Aviacão Civil), which, like the FAA, does not require the publication of landing distances on other-than-dry runways. However, the European Aviation Safety Agency (EASA) does require the publication of landing distances on other-than-dry runways if the airplane is to be operated on such runways. Therefore, to certify the airplane in Europe, Embraer proposed to EASA that the unfactored wet-runway landing distances presented in the EMB-505 AFM would be computed as 125% of the demonstrated, unfactored dry-landing distance, and EASA accepted this proposal. The unfactored landing distance is the actual distance from the runway threshold required to land the airplane and stop it without any safety factors applied. The factored landing distance is the actual distance from the runway threshold required to land the airplane and stop increased by a safety factor. The factored wet-runway distances in the EMB-505 AFM were 115% of the factored dry distances, or 192% of the unfactored dry distances. The EMB-505 AFM also provided a table of landing distances for landings on runways covered with standing water, slush, or wet snow at depths of 0.125, 0.250, and 0.375 inches. At 0841, the CXO automated surface observation system reported calm wind, visibility 2 miles in heavy rain and mist, a few clouds at 500 ft above ground level (agl), ceiling 8,000 ft agl broken, 10,000 ft agl overcast, temperature 23° C, dew point 22° C, and altimeter setting of 29.93 inches of Mercury. Remarks included the following: hourly precipitation 0.21 inch, temperature 22.8° C, and dew point 22.2° C.
A review of weather observations reported before and after the accident showed that the rain began at 0444. The rain varied from moderate-to-heavy intensity from 0725 until after the accident. The rain ended at 1129. The total precipitation reported between 0444 and 0847 (the time of the accident) was 0.45 inch. The total precipitation reported between 0444 and 1129 was 0.50 inch. CXO is located about 37 miles north of Houston, Texas. The airport is equipped with an air traffic control tower, which is operational between 0700 and 2200. The airport chart supplement lists an elevation of 245 ft and a magnetic variation of 5° east. Runway 1/19 is 5,000 ft long and 100 ft wide, concrete, and in good condition with a threshold elevation of 230 ft and 0.2% grade. The runway has a medium-intensity approach lighting system and nonprecision runway marking. The runway also has a two-light precision approach path indicator lighting system, which was out of service. Runway 14/32 was under construction at the time of the accident. As noted earlier, a NOTAM had been issued, which stated that the runway 14 threshold had been displaced 3,377 ft and that the ILS and RNAV instrument approaches were not available. The dispatch Flight Release for N322QS, showed that the landing was planned for runway 14 which was assumed to be wet. The NOTAMs were included in the Flight Release paperwork, but were overlooked by dispatch resulting in flight planning numbers predicated on the full length of runway 14. The pilots became aware of the runway information during the flight and they opted to land on runway 01. The automated terminal information service (ATIS) ZULU which was received by the crew reported the runway 14 takeoff and landing distance was 4,111 ft and the ILS for runway 14 was out of service. According to the FAA inspector who arrived on scene shortly after the accident, there were light tire scuffmarks on runway1, which began 1,877 ft before the departure end of the runway. There were no visible signs of rubber transfer on the runway. The airplane exited the departure end of the runway and continued about 400 ft through soft/muddy terrain before coming to rest on down-sloping terrain. The distance between the ground tracks made by the nose tire and the right MLG gear track was 18 inches, indicating that the airplane skidded after it departed the runway surface. A flat worn spot was visible on both the left and right main tires. Both tires showed evidence of reverted rubber hydroplaning. The airplane contacted a silt/erosion control fence during the overrun. The nose landing gear collapsed and separated from the airplane just before it came to rest. The airplane sustained substantial damage, including, but not limited to, damage to the forward bulkheads, composite ribs, forward fuselage frame, and the center fuselage area. Power was applied to the airplane after the accident, and a ground hydraulic power stand was used to generate a hydraulic system pressure of 2,850 psi. The brakes and spoiler system were tested, and both functioned normally. The antiskid auto-startup test was completed with no faults noted. The BCU, serial number 276920254, was removed from the airplane and sent to Meggitt in the United Kingdom. The recorded faults were downloaded, and the BCU was functionally tested under the supervision of an investigator from the Air Accidents Investigation Branch, and it functioned normally. Embraer downloaded the CMC messages on scene with the concurrence of the National Transportation Safety Board (NTSB) investigator-in-charge. The BCU faults and CMC faults and messages were correlated with one another and reviewed by Embraer. Although the BCU and CMC recorded four sequences of faults and messages, the data and the examination of the brake system indicated that the brake system functioned as commanded during the landing. The airplane was equipped with an L-3/Fairchild FA2100-3083 combination cockpit voice and flight data recorder (CVDR), serial number 000885510, which provided both flight data recorder (FDR) and cockpit voice recorder (CVR) functions. The CVDR was removed from the wreckage and examined at the NTSB Vehicle Recorder Laboratory, Washington, DC. The CVR contained 2 hours 4 minutes 14 seconds of good quality voice recordings. A CVR group was convened, and a transcript was prepared for the period from 0824:47 to 0848:01. The FDR contained 222 hours of data. Timing of the FDR data is measured in subframe reference numbers (SRN), where each SRN equals 1 lapsed second. The accident flight was the last flight on the recording, and the flight duration was about 1 hour 37 minutes. The FDR data showed the airplane initially on approach above 150 knots. From 0844:18 to 0844:38, the flap position increased from flap position "one" through to flap position "three," at which position it remained for the rest of the approach. At 0844:43, the brake pressure for the left and right MLG briefly spiked to about 3,000 psi and quickly returned to 0. During this time, the pilot brake pedal position remained near 0. The airplane continued the approach, and its approach speed steadily decreased to about 130 knots while on short final. At 0847:09, the brake pedal position parameters became active, and they began to increase just before touchdown. One second later, the left and right main wheel spin became active and then increased rapidly. Two seconds later, the speed brakes began to extend, and they reached maximum extension at 0847:14. About the same time, all four WOW discrete parameters became true. Between 0847:14 and 0847:24, the brake pressure for both MLG remained below 1,000 psi. During this time, the pilot left and right brake pedal positions increased to about 36 millimeter (mm) of pedal travel as the indicated airspeed, groundspeed, and wheel speed for both MLG steadily decreased. At 0847:24, the EPB discrete became active. Immediately thereafter, the brake pressure for both MLG plateaued near the system's maximum value of 3,000 psi, and the wheel speed quickly decreased to about 0 knots. Between 0847:27 and 0847:42, the brake pressure for both MLG remained plateaued about 3,000 psi. The pilot left and right brake pedal positions also remained steady about 35 mm of pedal travel as the KIAS and groundspeed continued to decrease. At 0847:24, a brake fail indicator discrete became active as the brake pressure for both MLGs dropped to 0 psi, and the pilot left and right brake pedal positions remained near the system's maximum pedal travel value while the airplane was experiencing measurable changes in tri-axis acceleration, consistent with it departing the runway surface. KIAS and groundspeed quickly dropped to about 0 knots, and the speed brake surface positions for the left and right speed brakes bleed position decreased to 0. The FDR recording ended at 1347:59 and showed the airplane at rest. The NTSB conducted an airplane performance study for the accident flight to determine the airplane's position and orientation during the relevant portion of the flight and its responses to control inputs, external disturbances, ground forces, and other factors that could affect its trajectory. According to the performance study, the airplane's approach to runway 1 complied with the operator's stabilized approach criteria, with the airplane tracking the RNAV final approach course and glideslope at an airspeed of about 130 knots. The airplane crossed the runway threshold at 121 knots (9 knots faster than Vref) and 45 ft above the runway and touched down about 903 ft from the threshold at a groundspeed of 118 knots. The headwind component at touchdown was negligible. After touchdown, the pilot brake pedal deflections progressively increased to maximum braking in about 11 seconds, and the airplane achieved a maximum deceleration of about -0.17 G at 0847:17, about 7 seconds after touchdown. Between 0847:19 and 0847:22, the deceleration increased briefly and then decreased until about 0847:23.5, 13.5 seconds after touchdown, as the wheel speeds decreased to 0, consistent with the application of the EPB and the beginning of a full, locked-wheel skid. The wheels remained locked until the airplane came to rest. During the skid, the deceleration steadily increased, before decreasing again to as the airplane passed the end of the runway at 0847:37.4. The airplane exited the runway about 27 seconds after touchdown at a groundspeed of about 61 knots. The performance study determined that, after the airplane touched down, the computed braking friction coefficient increased steadily as the brake pedals were depressed, reaching a peak of about 0.16 before decreasing steadily to about 0.06 after the EPB was applied and the airplane entered a full, locked-wheel skid; this decrease is consistent with research indicating that the braking friction achieved in a full locked-wheel skid (a braking slip ratio of 1.0) is significantly less than the maximum braking friction coefficient that can be achieved at lower slip ratios. However, even before the EPB was applied, the computed braking friction coefficient was significantly lower than what would have been predicated using models prescribed in 14 CFR Part 25 for computing accelerate-stop distances on a wet runway. The braking friction coefficient was also significantly lower than that implied by the unfactored, wet runway landing distances published in the EMB-505 POH, which are computed as 25% greater than the unfactored (demonstrated) landing distances on a dry runway. "However, the braking friction coefficient achieved during the accident was consistent with the predicted braking friction coefficient using a National Aeronautics and Space Administration (NASA) model that is based on runway friction measurements taken with a Ccontinuous Ffriction Mmeasurement Eqequipment (CFME) device." "The decrease in braking friction coefficient after the EPB was applied is consistent with research indicating that the braking friction achieved in a full locked-wheel skid (a braking slip ratio of 1.0) is significantly less than the maximum braking friction coefficient that can be achieved at lower slip ratios …." As part of the performance study, the NTSB and the parties to the investigation conducted tests on runway 1 at CXO to measure the runway macrotexture depth and the cross slope. Based on the results of the runway tests, the performance study determined, taking into account a rainfall rate of 0.3 inch per hour and the runway macrotexture and cross slope, the accident landing gear would have encountered a maximum water depth of about 0.006 inch, which was far below the 3 mm (0.017 inch) that the EASA Acceptable Means of Compliance 25.1591 considered a "flooded" runway. Therefore, it is unlikely that the accident airplane experienced dynamic hydroplaning during the landing and that the low wheel braking friction coefficient levels resulted from viscous hydroplaning, which is associated with the buildup of water pressure due to viscosity. The Phenom 300 Quick Reference Handbook (QRH) provided landing distance tables for various aircraft configurations and runway conditions. The QRH showed the unfactored runway distance required for a landing weight of 15,483 lbs and flaps 3 configuration to be 2,541 ft for a dry runway, 2,922 ft for a wet runway, and 4,885 ft for a contaminated runway (1/8-inch-deep water). The performance study also noted that, although the achieved braking friction was lower than that specified by the model used in the FAA regulations and ACs for a wet runway, the FAA model friction level was closer to the achieved friction than the friction level implied by the wet-runway landing distances in the EMB-505 AFM. That is, the friction implied by the AFM wet-runway landing distances was even higher than that predicted by the FAA model, whereas the FAA model itself overpredicted the friction level for this accident. Further, Embraer provided data that showed the deceleration recorded for the time interval before the EPB was applied during the accident flight was consistent with the results obtained from a simulation using the optimized performance analyzer software based on the expected brake coefficient prescribed in AMC 25.1591 for standing water contamination (3 mm) and contaminated drag based on flight test data produced for EASA certification purposes. The performance study concluded that, based on the runway characteristics and rainfall rate at the time of the accident, the water depth on the runway was well below 3 mm but that the braking friction coefficient achieved before the EPB was engaged closely matched that modeled for a water depth greater than 3 mm. Therefore, the circumstances of this accident indicate that some wet runways may provide friction levels closer to those used to model flooded runways than to those implied in the AFM wet runway landing distances even when the runway is not flooded. See the Airplane Performance Study in the docket for this accident for additional details. NetJets' FOM states that "every landing requires an adjustment to planned landing distance. The type of operation [that is, Part 91, 91K, or 135] dictates which adjustments are applied." The "planned landing distance" is the unfactored AFM dry landing distance for the airplane. The FOM defined a contaminated runway as one in which more than 25 percent of the required runway length, within the width being used, is covered by standing water or slush deeper than 1/8 inch or accumulation of snow or ice and a wet runway as one in which its surface is reflective. For dispatching a flight to a runway that is expected to be wet at the time of arrival, the FOM stated that, for Part 91 flights, the required landing distance is the unfactored wet landing distance specified in the AFM's FAA-approved landing performance data or the AFM's advisory data with no safety factor applied. However, in practice, NetJets dispatchers divided the unfactored AFM distance by 0.8, which resulted in a required landing distance greater than that specified in the FOM. For Parts 91K and 135 flights, the required landing distance was the unfactored dry landing distance from the AFM, divided by a safety factor of 0.6 with an additional safety factor of 15% applied. For all operations, the FOM also required pilots to perform a landing performance assessment to recalculate the required landing distance "if weather, runway surface condition, aircraft status, or any other relevant factor has degraded from those shown in the flight release package." An additional safety factor of 15% must then be added to the recalculated distance. NetJets Aircraft Operations Manual, Section 2.3.4, "Arrival Briefing," stated that, before conducting the arrival briefing, the crew should, if able, obtain the destination weather and landing information and program the flight management system (FMS). The pilot flying should transfer aircraft control and verify the FMS inputs and brief items pertaining to the arrival, including the arrival procedure (include altitude and airspeed constraints), NOTAMS, runway conditions, and landing performance assessment. These same items are also listed on the NetJets Normal Procedures Checklist under the Arrival Briefing section. In accordance with 14 CFR Part 23 Section 23.75, "Landing distance,"
(1) The steady approach must be at a gradient of descent not greater than 5.2 percent (3 degrees) down to the 50-foot height. (2) In addition, an applicant may demonstrate by tests that a maximum steady approach gradient steeper than 5.2 percent, down to the 50-foot height, is safe. The gradient must be established as an operating limitation and the information necessary to display the gradient must be available to the pilot by an appropriate instrument. (b) A constant configuration must be maintained throughout the maneuver. (c) The landing must be made without excessive vertical acceleration or tendency to bounce, nose over, ground loop, porpoise, or water loop. (d) It must be shown that a safe transition to the balked landing conditions of §23.77 can be made from the conditions that exist at the 50 foot height, at maximum landing weight, or at the maximum landing weight for altitude and temperature of §23.63 (c)(2) or (d)(2), as appropriate. (e) The brakes must be used so as to not cause excessive wear of brakes or tires. (2) Is used so that consistent results can be expected in service. (g) If any device is used that depends on the operation of any engine, and the landing distance would be increased when a landing is made with that engine inoperative, the landing distance must be determined with that engine inoperative unless the use of other compensating means will result in a landing distance not more than that with each engine operating. (5) The effect on landing distances of runway slope and 50 percent of the headwind component and 150 percent of the tailwind component. This SAFO urgently recommends that operators of turbojet airplanes develop procedures for flightcrews to assess landing performance based on conditions actually existing at time of arrival, as distinct from conditions presumed at time of dispatch. … Once the actual landing distance is determined an additional safety margin of at least 15% should be added to that distance. SAFO 06012 noted that, the dry-runway landing distances established during flight test and that are the basis for the factored landing distances used by dispatch, are shorter than the landing distances achieved in practice. In addition, AFM landing distances for wet and contaminated runways may also be based on the minimum dry distances obtained during flight tests. Consequently, landing distances on wet or contaminated runways computed from AFM data with little or no additional safety margin may be too short for normal operations. The SAFO recommended a conservative approach to assessing the landing distance requirements, including using the most adverse reliable braking action report or expected conditions for the runway and using values for air distances and approach speeds that are representative of actual operations. The SAFO recommended that a 15% safety margin then be added to the computed (unfactored) landing distance because "the FAA considers a 15% margin between the expected actual airplane landing distance and the landing distance available at the time of arrival as the minimum acceptable safety margin for normal operations." The root cause of the wet runway stopping performance shortfall is not fully understood at this time; however, issues that appear to be contributors are runway conditions such as texture (polished or rubber contaminated surfaces), drainage, puddling in wheel tracks and active precipitation. Analysis of this data indicates that 30 to 40 percent of additional stopping distance may be required in certain cases where the runway is very wet, but not flooded…. Possible methods of applying additional conservatism when operating on a runway which experience has shown degraded when very wet are assuming a braking action of medium or fair when computing time-of-arrival landing performance or increasing the factor applied to the wet runway time-of-arrival landing performance data. j. A Wet or Contaminated Runway. Landing distances in the manufacturer-supplied AFM provide performance in a flight test environment that is not necessarily representative of normal flight operations. For those operators conducting operations in accordance with specific FAA performance regulations, the operating regulations require the AFM landing distances to be factored to ensure compliance with the pre-departure landing distance regulations. These factors should account for pilot technique, wind and runway conditions, and other items stated above. Pilots and operators should also account for runway conditions at the time of arrival (TOA) to ensure the safety of the landing. Though the intended audience of SAFO 06012 is turbojet airplanes, it is highly recommended that pilots of non-turbojet airplanes also follow the recommendations in SAFO 06012. As a result of previous accidents, the NTSB had issued Safety Recommendations A-07-57 and 61. 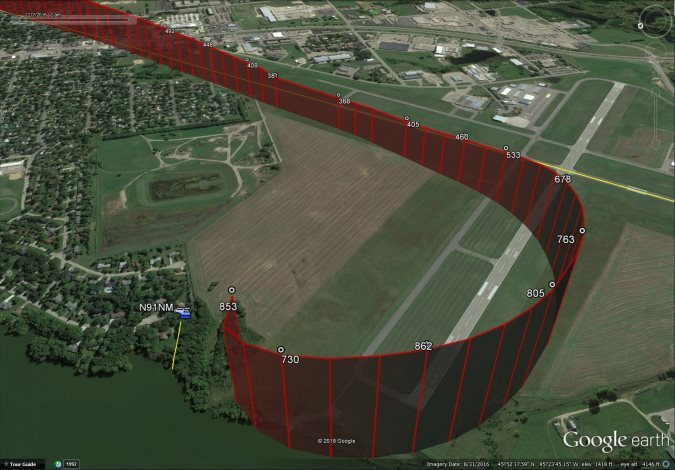 Safety Recommendation A-07-57 asked the FAA to immediately require all 14 CFR Parts 121, 135, and 91 subpart K operators to conduct arrival landing distance assessments before every landing based on existing performance data, actual conditions, and incorporating a minimum safety margin of 15 percent. Safety Recommendation A-07-61 asked the FAA too require all 14 CFR Parts 121, 135, and 91 subpart K operators to accomplish arrival landing distance assessments before every landing based on a standardized methodology involving approved performance data, actual arrival conditions, a means of correlating the airplane's braking ability with runway surface conditions used the most conservative interpretation available, and including a minimum safety margin of 15 percent. Safety Recommendation A-07-57 is currently classified "Closed—Unacceptable Action," and Safety Recommendation A-07-61 is currently classified "Open—Unacceptable Response." See the Airplane Performance Study in the docket for this accident for additional details. On September 11, 2015, NetJets issued Flight Operations Bulletin (FOB) 15-06, "Landing Considerations for Wet Untreated Runways." The FOB instructed pilots to determine if the runway had a treated (grooved or porous friction) overlay during the arrival briefing. It added that pilots should conduct a landing performance assessment using the AFM contaminated runway performance data for the lowest contamination depth when the following three conditions existed: 1) the runway does not have a treated surface, 2) thrust reversers are deferred or not installed, and 3) the airport is reporting rain or heavy rain. On December 14, 2016, NetJets issued FOB 14-12, "Use of Emergency Braking." The FOB instructed pilots to continue to use normal antiskid braking unless there is a positive indication of a brake system failure, at which time, they should apply corresponding aircraft AFM or QRH procedures. Ground Spoilers are deployed automatically upon touchdown with thrust levers at idle. Deployment failure of spoilers causes reduced normal braking effectiveness and may be misinterpreted as a brake failure. Do not engage the emergency brake system unless total brake failure is indicated (i.e., EICAS [engine indication and crew alerting system] message of a failed system affecting normal braking). For optimum braking efficiency, smoothly apply constant brake pressure after touchdown of the main landing gear. Do not pump brakes. On short of slippery runways, apply maximum braking. Maintain steady and increasing brake pressure, allowing the anti-skid system to function. NetJets worked with Flight Safety International to enhance its brake and antiskid systems training. On November 5, 2014, Embraer issued Flight Operation Letter (FOL) PHE505-018/14, "Landing Procedure Best Practices and Recommendations." Revision 1 was issued on August 14, 2015, and Revision 2 was issued on June 6, 2016. The FOL highlighted some information contained in FAA AC 91-79A and added information specific to the Phenom fleet. The letter stated that, due to the antiskid function, the BCU will automatically calculate the maximum pressure delivered to the brakes, based on the pavement condition. As a result, pilots will notice lower deceleration on a contaminated runway compared to a dry runway. CAUTION: The emergency parking brake will always deliver worse performance when compared to the normal brakes with anti-skid protection. Its use is only recommended on abnormal conditions, when the BRK FAIL CAS message is annunciated. In these conditions, applying the landing correction factors, determinate by the QRH, are mandatory. By definition, a wet runway is a pavement covered by less than 3mm (0.125") of water and the standing water has more than 25% of the pavement covered with more than 3mm of water…Also, be careful when evaluating a light rain over a non-grooved runway or a concrete polished surface. This may result in a slippery surface, which reduces braking action. In this case, the standing water numbers are more recommended than wet. The FOL states, "CAUTION: The emergency parking brake will always deliver worse performance when compared to the normal brakes with anti-skid protection. Its use is only recommended on abnormal conditions, then the BRK FAIL CAS message is annunciated. In these conditions, applying the landing correction factors, determinate by the QRH, are mandatory."